Don&apos;t let this gem of a home pass you by!! Great Mauldin location conveniently between Bethel and Butler Roads in the sought-after Hill Place Subdivision. Award winning Bethel Elementary and Mauldin schools. Just minutes to Greenville and Simpsonville. 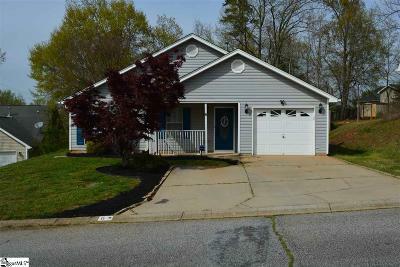 Welcome to your MOVE IN READY beautiful 3 bed 2 bath TRADITIONAL style OPEN FLOOR PLAN home on a quarter acre to enjoy. Entering through the ROCKING CHAIR front porch, rich laminate hardwoods greet you as you enter the spacious home with its huge GREAT ROOM featuring a Custom Tiled FIRE PLACE. Adjacent, the âheart of the home' is the Gleaming White Kitchen with BLACK GRANITE Counter Tops, ISLAND/BREAKFAST BAR, Tumbled Marble Back Splash, TILE floors. I love the sleek white appliances with abundant cabinets package, and Custom SPOT / PENDANT LIGHTS top it all off. Down the hall, past the laundry area, you will find the Large Master Suite with Ceiling Fan, FULL BATH neutral Carpets, and WALK IN CLOSET. The secondary bedrooms are opposite the master both have neutral carpet, and plenty of closets. They share a centrally located Full hall bathroom. The GARAGE is complete with an auto door opener, and let's not forget the fantastic COMPLETE PRIVACY FENCED back yard featuring a PATIO with STONE GRILL STATION and FIRE PIT. It's the perfect place for relaxing or entertaining friends and family. HAVE YOUR AGENT BRING A CONTRACT - BECAUSE YOU WILL BE MAKING AN OFFER ON THIS HOME!